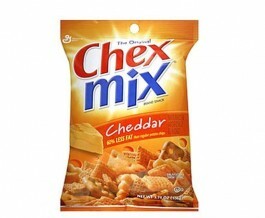 Chex Mix Cheddar gives you the best cheddar flavor experience. The bag contains a variety of tastes and shapes which makes every bite special. It contains 60% less fat than regular potato chips. Degermed Yellow Corn Meal, Whole Wheat, Wheat Flour, Enriched Flour (Wheat Flour, Malted Barley Flour, Niacin, Iron, Thiamin Mononitrate, Riboflavin, Folic Acid), Vegetable Oil (Soybean, Rice Bran And/Or Canola), Sugar, Whey. Contains 2% Or Less Of: Salt, Partially Hydrogenated Corn Syrup, Natural and Artificial Flavor, Malt Syrup, Baking Soda Yeast, Annatto Extract Color, Whey, Distilled Monoglycerides, Margarine, Onion Powder, Trisodium Phosphate, Yellow Corn Flour, Calcium Carbonate, Soy Lecithin, Dreid Cheddar Cheese Sodium Acid Pyrophosphate, Cheddar Cheese Powder, Monocalcium Phosphate, Sour Cream Solids, Maltodextrin, Yellow 5 Lake, Freshness Preserved by BHT and Sodium Metabisultfite, Autolyzed Yeast Extract, Yellow 6 Lake, Yellow 6, Yellow 5, Disodium Phosphate, Lactic Acid, Citric Acid, Spice. Contains Wheat, Milk and Soy ingredients.